Cornwall's Liberal Democrats have taken control of the county council. The Lib-Dems won 48 out of 82 seats in the local election, followed by independents taking 20 seats, the Conservatives nine and Labour five. A recount was called in Camborne West. Conservative councillor John Woodward regained the seat he momentarily lost to Labour councillor Charles Bickford. The returning officer said 20 Liberal Democrat votes were wrongly placed on the Labour pile. There were two other unexpected results: in Camborne North, Liberal Democrat John Pope won over Labour's Colin Godolphin. And in the Chacewater, Shortlanesend and Threemilestone ward, independent Pat Rowe, who had been a councillor for 16 years, lost to Conservative John Dyer. Ms Rowe said of her defeat: "I enjoyed my work very, very much. "If constituents had a problem, many officers knew that I would pester them very, very much. I will miss the job." 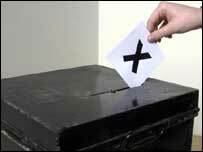 The number of county council seats has been increased to 82 from 79 because of an electoral review.